A Child Died a Father Cried and God Answered. 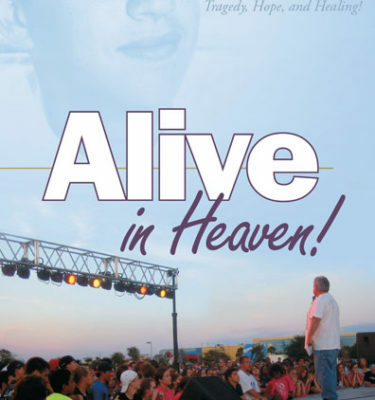 The Book: “Alive in Heaven” is being made into a feature film. The Movie rights are under contract and this real life story of tragedy, hope and healing is planned to hit the big screen. “Today I picked up a copy of your book to share with a father whose daughter committed suicide this week. I have a 5 yr old with lots of questions and she was asking about your book. I explained a little of what it was about and she wanted to see a picture of your son. She then asked me if… he was in heaven. I told her yes he was, because he had asked Jesus to forgive him of his sins and asked Jesus to come into his heart and save him. He believed that Jesus died on the cross for his sin and wanted Him to be King over his life. This is all stuff she has heard before. Well today for whatever reason, it clicked. She says, “Mama – I need to get saved, I have not done that and I want to see Jesus someday. How can I get Him in my heart?” I went over it again with her asking her questions making sure she understood. So today prayed to receive Christ.